You don’t need to be a tennis fan to get behind this match set. HBO has just released the first teaser for their upcoming mockumentary 7 Days In Hell and it stars quite the pair. Andy Samberg will be pitted against Kit Harington it what looks to be an absolutely ridiculous tennis match for the ages. Set in the 80s, Harington and Samberg’s characters will play one of the longest, most epic tennis matches of all time, and only one can rise to the top. Check it out. HBO just released this teaser for 7 Days In Hell which features Andy Samberg playing the hot-headed Aaron Williams, in typical Andy Samberg-form. While Kit Harington takes on the role of Charles Poole, a more comedic tone than the seriousness we’ve grown used to from his character in the HBO hit series Game of Thrones. Both will go head to head, exposing plenty of goofy one-liners, strange interactions, and crazy competitiveness as this seven-day, five-set marathon of a match drains the life out of the tennis pros. The outrageous sports comedy comes to us via film director Jake Szymanski, a veteran director of NBC’s Saturday Night Live as well as a number of Funny or Die sketches. The match between both Samberg and Harington’s characters lies at the center of this documentary-styled comedy. But, it will be jam packed with other celebrity appearances and input, including Lena Dunham, Will Forte, Michael Sheen, Mary Steenburgen, Karen Gillan, Fred Armisen, June Squibb, and Howie Mandel. Also of note are a few real-life tennis stars, John McEnroe and Serena Williams, which will help give the film just a little hint of legitimacy amongst the ridiculousness. The teaser trailer packs in everything we need to get excited for this hysterical HBO event. 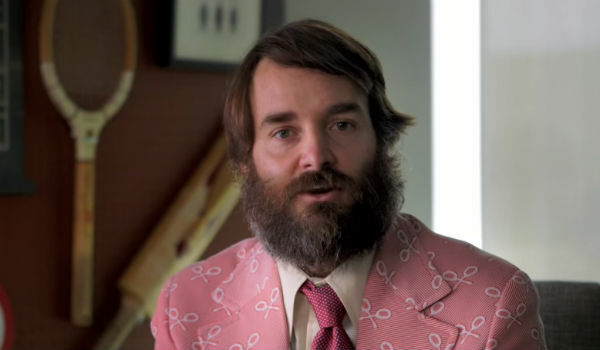 From the 80s attire, to the over-dramatized play, to Will Forte staring straight into the camera lens rocking a pink tennis racket-patterned suit, it basically feels like an extended SNL skit, packed with funny celebrities. Oh and did anyone else catch Andy Samberg trying to smooch Kit Harington? Yep, that happens. The exclusive HBO presentation will make its debut on Saturday, July 11th at 10 p.m. ET/PT. 7 Days In Hell will premiere during the first weekend of this year’s Wimbledon tournament, so it is sure to attract tennis fans, and comedy seekers alike.